Edward Hopper, Woman Smoking, Looking Out Window, 1940. The practice of evidence-based design, as it is defined and credentialed, as its history is told, its storehouse of knowledge kept at the Center for Health Design, famously begins with a single study by psychologist Roger Ulrich. Having published previously in environmental psychology, specifically on the subjects of “visual landscapes,” he made a discovery in 1984 that helped to create an entirely new field of study. 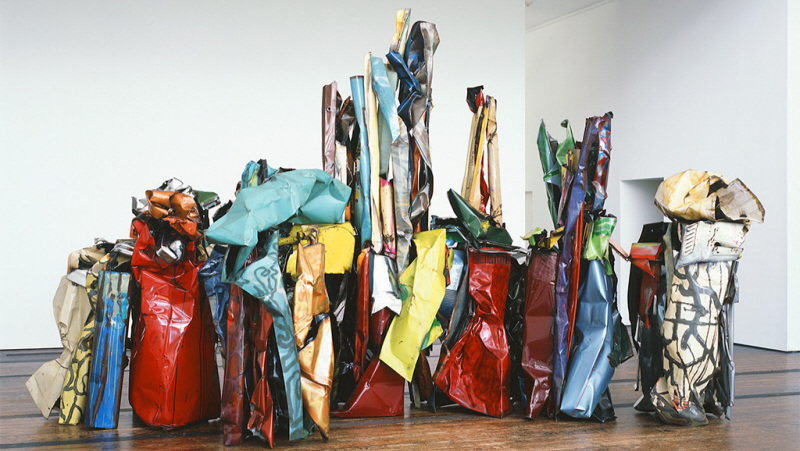 John Chamberlain, “American Tableau” 1984. If you were howling when you read the subject recommendations for “evidence-based art,” perhaps you know a thing or two about visual art. You may be an artist, an interior designer, or a collector. You may be a gallery-goer, a museum devotee, or a fine-art gadabout, like me. You may have studied some art history, entered the art market, or even followed innovative art practices that are leaving galleries and museums behind. But we must recognize and acknowledge that we arts professionals and enthusiasts, by virtue of our practice, experience art differently from other people. The “Guide to Evidence-Based Art” was published in 2008. In ten years, a lot of new data, new questions, and new ideas have made it clear that the guide must be updated. The consequences are real. Jennifer Steinkamp, “Mike Kelley 1,” at Cleveland Clinic Children’s. Photo by Steve Travarca, Cleveland Clinic Center for Medical Art & Photography. When people ask me what I write about, I bring up our shared experience of ordinary encounters with the healthcare system. Visits to hospitals, doctor’s offices, specialty clinics, physical therapy, childbirth, treatment for chronic disease, emergency care, waiting at the pharmacy, regular wellness exams, eye exams, dental exams, as well as our visits to attend to our friends and and family who are sick or dying. What does it look like? Do you notice the art? Did you know that someone had to make deliberate decisions about what works of art to acquire and install? How were these decisions made? In the field of healthcare design, where decisions are made by hospital administrators, architects, and the teams they recruit to launch and direct expensive building and renovation projects, it wasn’t always the case that design decisions were made by first deliberately looking at what available evidence would have to say about this or that design choice. “There’s tremendous power in the group.” Photo by Coburn Dukehart/NPR. It’s notorious difficult to trace measurable health outcomes to arts interventions in healthcare design. Participatory art programs and art therapy, on the other hand, are regularly evaluated in terms of their beneficial outcomes. I do want to draw a connection between participatory programs and art design in order to make the claim that “arts in health” - the term that encompasses all the many interventions - must play an essential role in healthcare delivery. But first, I want to highlight one aspect of visual art design that has so far been neglected by the current scholarship, as well by the most accepted professional guidelines: its ability to foster social connection. A visitor at the Louvre, Paris. Photo by Dustin Gaffke. Hospital systems are increasingly adopting the framework offered by the field of public health, or community health, to address their communities as a whole, not just individuals who are ill. Public health practitioners begin with the principle that health outcomes have social determinants, which include safe housing, places to walk and socialize outdoors, contact with nature, access to healthy food, and of course access to the arts. From Chauvet Cave, southern France, between c. 33,000 and c. 30,000 years ago. Illustration by Thomas T.
I recently attended the annual meeting of the National Organization of Arts and Health (NOAH) which was very illuminating, and for my interests, very helpful for understanding the larger contexts of the subjects I’m pursuing here: visual art, health, and design. I’m sure I will have more to say about those contexts later, but first a note about what we mean when we talk about art. So here’s where it all begins. The concept of dignity recurs often in the discourse of healing design. The theory of supportive design names dignity explicitly in as part of its formulation. Recent work on the concept of healing - as opposed to curing - also identify dignity as one of several as defining qualities. And the meaning of dignity itself deserves some attention. I’m excited to launch an exploration of art, design, and health. I am a writer, researcher, and thinker, challenging practitioners and decision-makers with insights from across disciplines. I examine the successes and challenges of those who are doing this important work. Step one: launch the website.